It is by baptism (also called Christening) that we become a member of the Church, our original sin is washed away and we receive the Holy Spirit. Baptism makes us children of God the Father and brothers and sisters of Jesus, God the Son. It is a joyful event for just as we celebrate the birth of a child into a family here on earth, so we celebrate the new birth of a baptised person into the family of the Church. Life as part of the family of the Church may go on for all eternity thanks to the resurrection of Jesus. Members of the family of the Church gather together at Mass each week: baptism is therefore not an isolated event. It is the beginning of a lifetime of commitment to Christ and His Church. 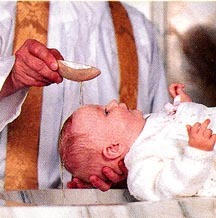 At a baptism of a baby, the Catholic parent or parents of the child promise to bring that child up as a Catholic. (Therefore at least one of the parents must be a Catholic). They say that they will help their child grow in faith. 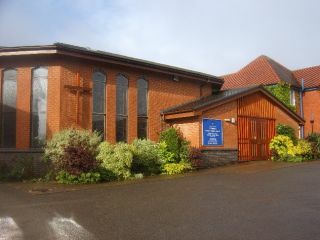 If you would like your baby baptised then please speak to the parish priest at the end of Mass. (Arrangements cannot be made over the 'phone). He will give you a form to fill in to give your child's name and address. Once this is returned, he will then arrange a time to meet you and talk about the meaning of baptism and the service itself, and to confirm the date on which it will happen. This entails some preparation of the child, depending upon his or her age, and cannot be done without some commitment on the part of parents and the child. Attendance at Mass is of course expected. Please see the parish priest. If an adult is not baptised and wishes to join the Church then there is time of preparation, of learning about the faith. At the baptism of an adult, the adult has to declare his or her belief in Jesus Christ and the teaching of the Church. The time of preparation is to discover and understand what being a follower of Jesus and a member of His Church means. Please speak to the parish priest in the first instance. Congratulations on your engagement! To be married in the Catholic Church at least one of the couple must be a Catholic. Before a couple may make their marriage vows, the Church has to make sure that they understand what marriage means. There is therefore a course of preparation as well as the paperwork which must be completed. Some of this paperwork involves the local civil Registrar. Please speak to the parish priest and preferably with as much notice as possible and no less than six months.